Mindfulness practices date back some 2,500 years to the early teachings of the Buddha. However, it has only recently caught the attention of researchers. Lung cancer has many of the same symptoms as malignant pleural mesothelioma (MPM). Shortness of breath, chest pain, and weight loss are a few. Both diseases affect the lungs and both can result from asbestos exposure. 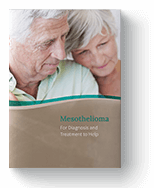 In fact, asbestos is the only cause of mesothelioma. Because the diseases have many similarities, doctors treat them in similar ways. Surgery, chemotherapy, and radiation therapy are standard first-line treatments, with complementary and alternative medicine (CAM) therapies such as acupuncture in line to help control symptoms such as pain and anxiety. Now, researchers say mindfulness (the quality or state of being conscious or aware of something) could also be an effective CAM therapy for lung cancer, helping to relieve the tremendous amount of stress that comes with managing the disease. In the study published in the Journal of Thoracic Oncology, researchers found that psychological distress can be effectively treated in lung cancer patients with Mindfulness Based Stress Reduction + solely care as usual (CAU+MBSR) versus solely care as usual (CAU). The research team performed a multicenter, parallel-group, randomized controlled trial. Patients with lung cancer and their partners were randomly allocated to CAU+MBSR or CAU. MBSR is an 8-week group-based intervention, including mindfulness practice and psycho-education on stress. CAU included anti-cancer treatment, medical consultations and supportive care. The primary outcome was psychological distress. Secondary outcomes included quality of life, caregiver burden, relationship satisfaction, mindfulness skills, self-compassion, rumination and post-traumatic stress symptoms. Outcomes were assessed at baseline, post-intervention and at 3-month follow-up. Linear mixed modeling was conducted on an intention-to-treat sample. Moderation analyses were performed. 31 patients and 21 partners were randomized to CAU+MBSR and 32 patients and 23 partners to CAU. CAU+MBSR patients reported significantly less psychological distress than CAU patients did. Baseline distress levels moderated outcome: those with more distress benefitted most from MBSR. Additionally, CAU+MBSR patients showed more improvements in quality of life, mindfulness skill, self-compassion, and rumination than CAU patients did. In partners, no differences were found between groups. If you are being treated for mesothelioma, ask your doctor about mindfulness. CAM therapies such as this could help relieve the stress and anxiety that naturally occur with the disease. Fossas, Andres. "The Basics of Mindfulness: Where Did It Come From?" Welldoing. Welldoing LTD., UK, 27 Jan. 2015. Web. 05 Jan. 2018. Schellekens, Melanie, Desiree Van Den Hurk, and Johan Molema. "Mindfulness-Based Stress Reduction Added to Care as Usual for Lung Cancer Patients and Their Partners: A Randomized Controlled Trial." Journal of Thoracic Oncology. International Association for the Study of Lung Cancer (IASLC), 26 Dec. 2017. Web. 02 Jan. 2018.